Wood Acres arborists are experts in the proper pruning of young trees. Experienced pruning is essential in developing a tree with a strong structure and desirable form. Trees that receive the appropriate pruning measures while they are young will require little corrective pruning when they mature. Pruning of newly planted trees should be limited to corrective pruning. Remove torn or broken branches, and save other pruning measures for the second or third year. The reason that you may want a trained arborist to manage your new tree's pruning is because each cut has the potential to change the growth of the tree. Proper technique is essential. Poor pruning with the wrong tool can cause damage that lasts for the life of the tree. Wood Acres will prune your young trees to establish a strong trunk with sturdy, well-spaced branches. The strength of the branch structure depends on the relative sizes of the branches, the branch angles, and the spacing of the limbs. Naturally, those factors vary with the growth habit of the tree. Pin oaks and sweetgums, for example, have a conical shape with a central leader. Elms and live oaks are often wide spreading without a central leader. 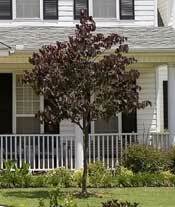 Other trees, such as lindens and Bradford pears, are densely branched. Good pruning techniques remove structurally weak branches while maintaining the natural form of the tree. For most young trees, Wood Acres Tree Specialists maintains a single dominant leader growing upward for good trunk development. Sometimes a tree will develop double leaders known as co-dominant stems. Co-dominant stems can lead to structural weaknesses, so we remove one of the stems while the tree is young. The spacing of branches, both vertically and radically, in the tree is very important. Branches selected as permanent scaffold branches must be well spaced along the trunk. Maintain radial balance with branches growing outward in each direction. The proper vertical spacing of permanent branches is equal to 3 percent of the tree’s eventual height. Thus, a tree that will be 50 feet tall should have permanent scaffold branches spaced about 18 inches apart along the trunk. Avoid allowing two scaffold branches to arise one above the other on the same side of the tree. Some trees have a tendency to develop branches with narrow angles of attachment and tight crotches. As the tree grows, bark can become enclosed deep within the crotch between the branch and the trunk. Such growth is called included bark. Included bark weakens the attachment of the branch to the trunk and can lead to branch failure when the tree matures. Wood Acres prunes branches with weak attachments while they are young. The leaves of each branch must manufacture enough food to keep that branch alive and growing so Wood Acres is careful not to overthin.We are careful to maintain at least half the foliage on branches arising in the lower two-thirds of the tree.